Tomatillo (pronounced toh-MAH-tee-YO) is a relative of the tomato family. Tomatillos are of Mexican origin but are now grown in many other places in the Western hemisphere. The fruit is surrounded by a thin paper-like brownish husk and is ideal for use when it is still green. Tomatillos are often confused with green, unripe tomatoes but unlike tomatoes, they have a distinctly tart, almost lemony flavor. This gives it an authentic flavor in a variety of Mexican green sauces and salsa. They also taste good fried in olive oil or grilled and seasoned with salt and pepper. I made a chutney using tomatillos for the first time, over the weekend and just loved it. Heat the oil in a pan. Sauté the onions, add the ginger-garlic pastes and green chillies followed by the chopped tomatillos and jaggery. Cook till the tomatillos are done and turn to mush. Allow the mixture to cool & then blend well along with roasted peanuts to get a thick chutney. This chutney would be the perfect accompaniment to these instant dosas or even these not-so-instant dosas. It would also make a great tangy dip for baked tortillas or could even serve as a spread on any kind of toasted bread. I had it with some hot dosas and it was really good. This is one chutney I will definitely be making again. This surely must have been finger-licking good! What a tangy delight :). love the colour of that chutney.. are tomatillos sour? I keep eharing about this fruit from all of you... doubt we get it here :) looks yummy. 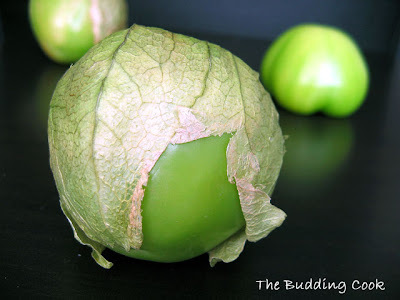 I love tomatillos, and this sounds great with the toasted peanuts! Thanks for introducing this new veg. will try to find out one, nice chutney..
Yum... nice variation to the regular chutneys. Addition of peanuts and jaggery makes my mouth water. I know only a salsa recipe using tomatillos. Thanks for sharing this. I use tomatillos in many varities. I make dal,chutney, pair up with brinjal but never tried with peanuts. Will try your version for sure. Nice variation... I love mango chutney, it has such a distinct taste, and looking at your tomatillo chutney it makes me drool here. Lovely chutney TBC, My hubby just loves the Tomatillo sauce served at Moe's with the mexican fare. Will try it out. Anything tomatillo, I'm up for it...love the chutney!! Love tomatillos and especially new ideas to use them in the kitchen, although they are rather pretty in a bowl when still in their husks. This looks really tasty and easy, TBC. I make dal and pickle with this one but never tried chutney. Looks delicious and lovely colour. I will try it sometime..
BTW, I followed your advice and I tried Trupti's recipe for chana-bateta nu shaak. Loved the result and blogged about it (of course). I love tomatillos! Looks like some tasty dishes. I have seen this in supermarkets, but have not tried any dish with it. I like tangy vegetables. It's a pity we don't get tomatillo here. How do you think green tomatoes will work with this recipe? WOOOOOOOOOOOW.....great things you share here. With ginger and garlic taste it is tastier. And also little sweet you add give delicious taste. TBC - the chutney looks delicious. Happy Diwali to you and your family! Never used tomatillos. Very good recipe, would give it a try soon! happy diwali! Musical- It really was! I am making it again over the weekend. Nags-They are soooooooooooopar sour;-)But I added a lot of chillies for some heat and some peanuts & jaggery too .All that helped to mask the sourness a little bit. Asha, yeah it really is sour. I added a lot of chillies for some heat. Seena, do try it if you can lay ur hands on this veggie. Sirisha- it is NOT tomatoes, girl:-(...but yeah, that wd be a nice combo too! Kribha, thanks and u r welcome:-)I have not made a tomatillo salsa yet. Would love to hear your recipe. Lakshmi, thanks.Hope you are cooking up a storm in ur kitchen for Diwali. Hima-Now I have never used it in a dal. Should try that out. I am so glad you tried the pesto. What did u have that with? Thanks:) Thanks also for the Diwali wishes. Hope you are enjoying yourself. I have to try the dal sometime. 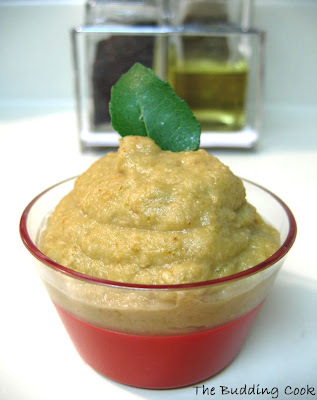 Raw tamarind chutney-now there's an idea for next time! Shweta, ooh tell me more about the soup. I would love to hear the recipe for that one. Do let me know if u make this. Latha, thnaks:)I don't think it would taste quite the same though u could give it a shot along with some tamarind. Try it. They are well worth the money spent. Glad I could point u in hte right direction. I have tried so many recipes from Trupti's blog and each one of them has turned out well. Rajitha & Laavanya- thnaks girls:). Wish you and your families the same. Kaajal, thnaks dear. It is nice to see u here again . Hope you had a great Diwali. Mandira, thanks:)Diwali wishes to u too. Smita, it is nice to see you here. Happy Diwali to u too. Hey TBC ,A very happy Diwali to you too, and the chutney looks fab! Happy Belated Diwali to you and your family. What a great way to use Tomatillos! Love the idea! I absolutely love such chutneys! TBC - Tagged u - check on my blog please! This looks wonderfully tangy n finger licking good. i have never tasted tomatillos. the chutney sounds really tasty! Sig - I made it again this week. that's how much I liked it! Hope you stop by often. I bought a pack almost two months back, tried out two recipes but still have so much left! Do you have any easy recipes using phyllo dough? Hey I have seen this in store and never knew what it was. Next time will definitely buy and make it.